I heard the news this morning. And I only learned of his passing because I opted to walk to the LIRR. Earl was a can collector—he spent sleepless nights following his wife's death collecting cans, spending the pocket change he received for his efforts on a cup of coffee, but really he was looking for a means of staving off loneliness. Earl was a part of my community. He was someone I looked for on early mornings—a signal that I had made it to a "safer" zone on my morning walk to the commuter rail. (My neighborhood is relatively safe and quiet, but there's a zone of moderate to heavy commercial activity that can at times make anyone a little anxious about personal safety.) He generally had a smile and a wave for me when we our paths crossed, and though we saw each other infrequently, I generally had a sense that he was a part of my routine. A fixture if you will allow it: I knew he'd be there, in the supermarket parking lot most mornings unless he was unwell, either unpacking his cans or walking the lot with his hands in his pockets waiting for the depository to open. His passing has sent ripples through my sense of my network, but I am also aware of how quietly and how quickly those ripples smooth themselves away and how the network, how my sense of community, works to resettle itself around his absence. Bateson feeding on algae earlier this year. I had been thinking a great deal about communities and networks lately. 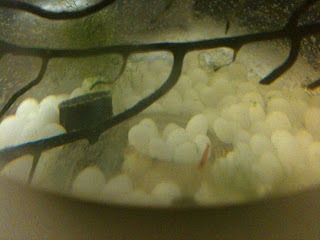 And Earl drives home these musings as his death comes on the heels of the death of another: Bateson, the last remaining shrimp in my ecosphere died last week. Two years ago, S purchased an ecosphere for my desk at work. 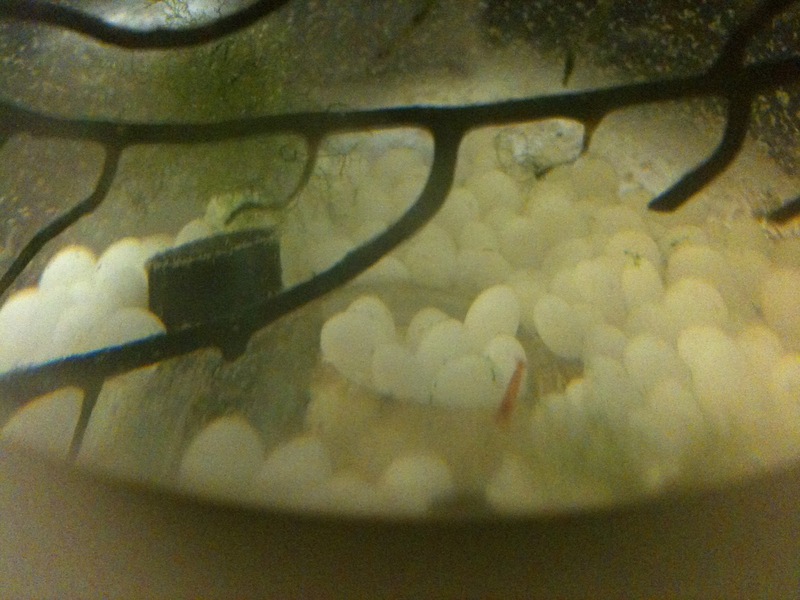 It was populated with five shrimp, one of which seemed to molt more frequently than the others. I named this shrimp Bateson because in his molting I saw properties of schismogenesis. He was the only one to survive the months on my desk until last week when I discovered his tiny pink body tangled within the algae that cohabited his world. I am not trying to equate the death of a man with the death of a shrimp, but with news of Earl's passing, the empty ecosphere on my desk seems especially lonely. Networks are imbued with lives and a resiliency of their own. When death removes a member, the network sews together the hole left by the departed. The network is reknitted and life continues. But in my empty ecosphere, where the algae is poised to claim the small globe, there is no reknitting. Things are forever changed. The algae will now fill the space vacated by Bateson, and a new balance and order will be established. And it is a reminder that a loss to one's community, even if that community attempts to patch itself together, leaves a mark. A very touching piece Krystal! I would feel the same way if something happened to one of my regular customers (usually older males who want free things, and aren't real customers after all). Great article. It's often a pleasure to read posts that weave philosophical musings into the fabric of our modern lives. In the larger picture, should there be any reason why Earl's passing is less significant than a shrimp's in their respective ecosystems? Although there's a black comedy aspect to the comparison, it's still valid. The nutrients absorbed by the algae make some material difference to that life and Earl's passing has made some material difference in your outlook on life. Intriguingly, your role as observer to the existence of both parties has ensured a temporary continuity somewhat removed from the organic. In a sense, your published contemplation has become a philosophically-defined complimentary schismogenesis. Thanks Sylvia. Communities are certainly dynamic entities, and they shift to accommodate even the smallest participants. Kandinsky, thanks for your thoughtful commentary. I don't think I quite let myself admit how deeply I was mourning Bateson until I heard about Earl—Earl's death let me really see the ecosphere differently or perhaps it allowed me to reconcile my sadness over Bateson in relatable terms. "In the larger picture, should there be any reason why Earl's passing is less significant than a shrimp's in their respective ecosystems?" I think not. Both were important to me. And in a sense, I was a part of both of their ecosystems. It is fascinating to watch the ecosphere change in Bateson's absence as it gives me a means of visualizing the changes that occur to networks following the death of a member. I'm torn as to whether I keep the sphere or whether I should discard it. For now, I think it will remain on my desk—as the algae reknits itself (I shook the sphere fairly vigorously and broke the algae into pieces when I found Bateson), it continues to generate perceptions of schismogenesis.